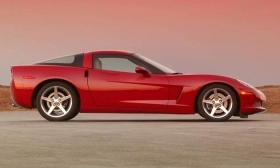 Nearly 22,100 Corvettes are involved in the recall. General Motors Co. is recalling Chevrolet Corvettes from the 2005 through 2007 model years because the roof panel may blow off. The recall covers Corvette coupes with the removable roof panel. There's a problem with the adhesive that bonds the plastic roof panel to its frame. If the bond breaks, the roof panel could go flying off while driving. There are clues to the problem, such as a snapping noise from the roof when driving over bumps, water leaking from the headliner, or the roof panel moving when the door is closed. Nearly 22,100 cars are involved in the recall. Those with a bad panel -- GM has previously run a customer satisfaction campaign for this problem -- will get a new panel. GM says it will start the recall in January.